A NEW, highly specialised, €24,000 scanner has been installed at Gibraltar’s National Archives. 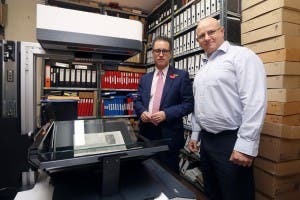 The German machine, funded by a grant from the Parasol Foundation Trust, can digitalise documents such as newspapers, maps and government files. This will allow a permanent, digitised collection of historic documents, which can be easily searched through. “In a single hour, this machine has been able to scan all the copies of the El Mono newspaper from 1879 – over 260 double pages in all,” said the Archivist, Anthony Pitaluga. The machine scans at up to 600 dsi (dots per square inch) and can handle documents as large as A1 size. It is designed to protect the spines of old books and has a special glass plate which protects the pages from both the scanner’s bright light and laser beam. The Parasol Foundation Trust is a philanthropic trust established under Gibraltar law in 2004, which aims to ‘help communities address some of the important health and education challenges facing them, leveraging cutting edge technologies and Internet-based solutions’.